php - How can I implement an "interesting tags" feature like that on Stack Overflow? How can I implement an “interesting tags” feature like that on Stack Overflow? I add into the "interesting" list my interested tags (like php, mysql, jquery and so on). Then, if any of the displayed questions has some of the tags in my list, it makes the background orange. I understand how to use jQuery to do that (there are related questions on that), but can't figure out how to implement the back-end portion using MySQL! There is a row in mysql for every member, let's call it "interested_tags". After I write and submit my tag through input, it is being written in a row "interested_tags". Am I thinking right or is there any way to do it? EDIT: So, can you show me an example or give me some tips how to implement this with many-to-many relationships? Thanks. As mentioned in the other answers, there's most likely a many-to-many relationship with between users and tags, represented as an own table. I made a SQL demo of a simplified case. The InterestingTags table is the table connecting what user is interested in what tags. Now let's introduce a questions table. For simplicity, let's say a question can only have one tag. /* Let's add a many-to-many relationship between questions and tags. One asking for what tags the user is interested in. 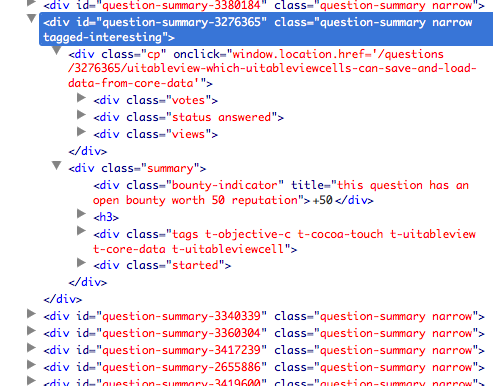 To "mark" a question with its tags, it adds a class for each tag it belongs to -- e.g. a question tagged with jQuery (where jQuery has the ID 1) and php (with ID 2) will have the classes tagged-1 and tagged-2. const user_id = 1; //what user is viewing the page? More likely, there is an additional table that represents a many-to-many relationship between users and tags. With another table that associates tags with questions. Then you'd just need a query (or more likely a stored procedure) that compares a user's tags to a question's tags and returns a boolean true or false. Stack Overflow tags work with at least * in the tag, so store your tags in an array and iterate through them, using pattern matching (doesn't matter whether you use glob, SQL, or regex, as long as the user knows which will be used). @new question: http://skmzq.qiniucdn.com/data/20060423142114/index.html contains an (old but useful) comparison of different kinds of taggning. Don't forget to read the comments, they're very useful. JS iterates over each question and changes an attribute based on a match (includes removing the post if it matches an 'ignored' tag. Not the answer you're looking for? Browse other questions tagged php jquery mysql tags or ask your own question.